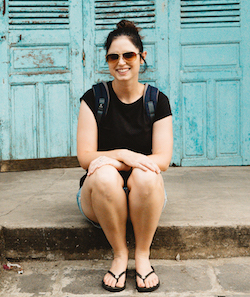 In my first Monday Spotlight I shared about my experience in Stellenbosch (pronounced Stellenbosh) since it's where I spent my first year and a half in South Africa, where I met Jurgen and also has one of the most rockin student vibes I've ever experienced. Still, when I was looking through some old photos the other day, I realized I left an essential part of what makes Stellensboch Stellenbosch out of the picture in that post... and that is Jool (Maties alum out there, back me up on this one!). Jool basically signals the hugest beginning of the year campus rush anyone could ever imagine. This is because a very large portion of the students stay in on-campus residences (much more so than in the states) at Stellenbosch University and in many ways these operate in a similar fashion to sororities and fraternities. 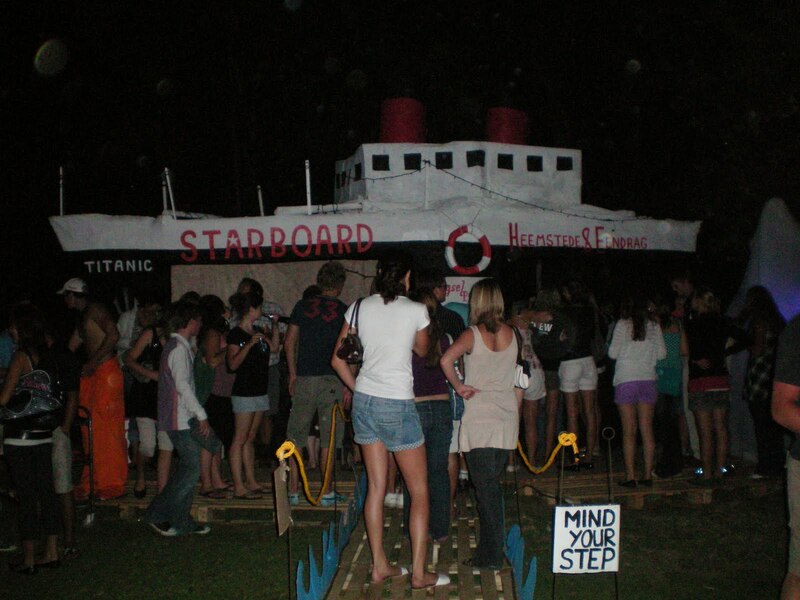 As part of "rush" all 1st years are required to partake in crazy activities around campus and alumni come in the tens of thousands each year to watch this take place. To give you an example, one of the "competitions" is for each residence to decorate their own trolly (aka shopping cart), put someone in it and then race it down the street at brake-neck speed through an obstacle course... most amusing thing to watch ever! 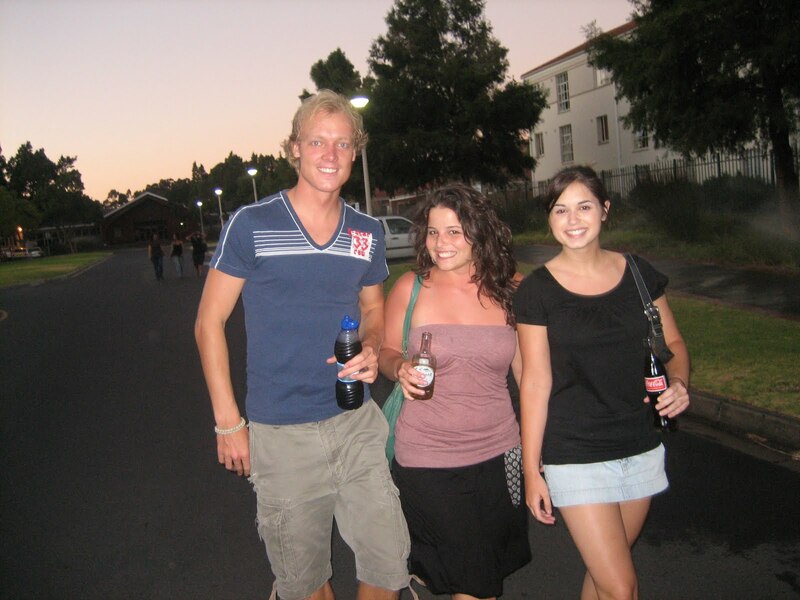 me, my roomie and our neighbor walking to vensters in 2008! One of the stages - they take elaborate to a whole new level! 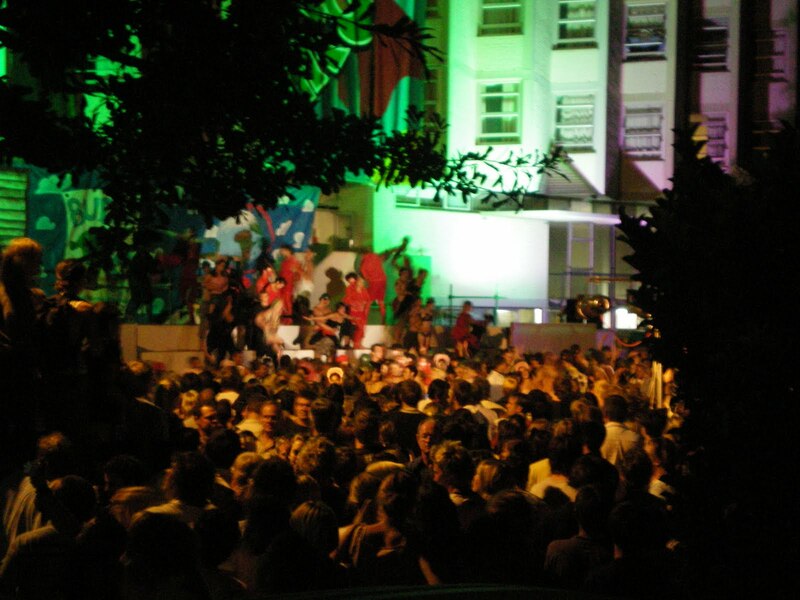 Jool happens around the first week of February every year (side note - in South Africa, the academic year begins in the beginning of Feb, which also happens to be during the peak of summer in the southern hemisphere), so if you're planning on visiting Stellenbosch that is a great time to come. Also, if anyone is interested in studying abroad at Stellenbosch, they offer a host of transferable international courses and also a wonderful service learning program. I went through AIFS when I studied abroad and loved it, but CIEE also has a great program. Feel free to email me if you have any other questions - I'd love to help convince you to visit! I just stumbled upon your blog and love it! Love the new look here Jenna! The idea of Vensters started in the early days of Stellenbosch. The ladies hostels would put up a show/play for the guys hostels through their windows or 'Vensters'. And that how it started, as far as I know. Its like Ser at the Puk, it started with boys serenading girls at their hostels, and now its a massive competition.